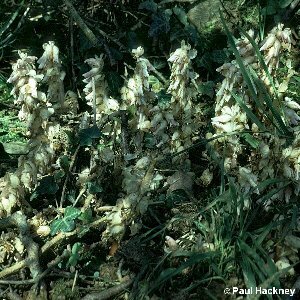 This strange-looking plant flowers in March and April, and is always found associated with a tree or shrub, usually in woods and parks. It is a parasite of many species of tree or shrub such as lime, poplar, sycamore, horse-chestnut, hazel, cherry-laurel, Lawson's cypress, plum, etc. It has no leaves and no green chlorophyll since it derives all its food for growth from its host tree. 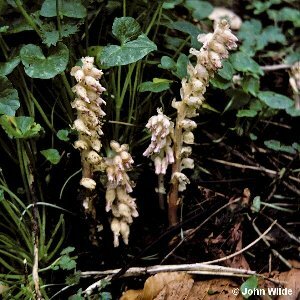 Although quite frequent, it tends to be regarded as rare, probably because it flowers and dies back before the summer begins. The whole plant is whitish or tinged with pinkish-purple. All names: Lathraea squamaria L.